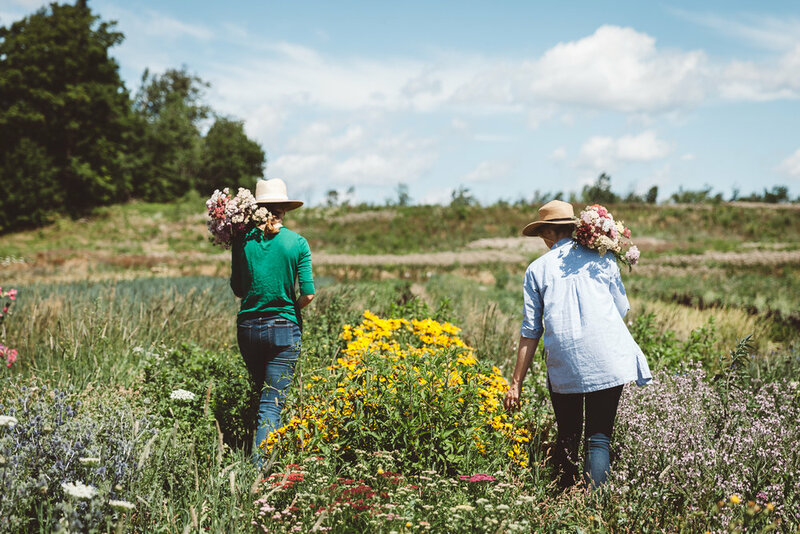 Join me, Jessica Payne, and Jessica Gale of Sweet Gale Gardens for a series of in-depth, interactive community workshops on growing and arranging flowers. Workshops will be held at Black and Smith Country General, in Jerseyville, ON, just outside Hamilton. The three complimentary workshops can be taken together as a series or separate. Discount rate of $275 is available for all three classes or $200 for the last two sessions. Use the code FLOWERCOMBO to receive $25 off your purchase, when registering for both the second and third sessions in the course. Each class will end with a free and open community activity. Learn how to plan a garden for cut flowers, selecting plants for all-season interest, colour and attracting pollinators. We will start some seedlings together and learn good techniques on how to raise seedlings in your home for your garden. Bring your extra flower, vegetable, and herb seeds to share with the community in a seed swap at the end of the workshop. Learn ways to build your garden soil, how best to plant and care for seedlings, including demonstrations in the garden at Black & Smith. Bring your extra flower, vegetable, and herb plants and divided perennials to share with the community in a plant swap. Learn the basics of floral arranging techniques. Students are encouraged to bring blooms and greenery from their gardens to use and share. Locally grown blooms will also be provided for arranging. Simple woodfired ceramic vessels will be provided by artist Emma Smith for each participant. Bring extra blooms and old vases to swap with the community in a “floral potluck” and vase share. Jessica specializes in teaching floral design workshops, facilitating artist retreats and creative consulting for Individual or Small Business Development. She will help you to draw out your authentic self through the art of storytelling and reconnecting to the natural world. Workshops are seasonally oriented and often praise a particular flower or design concept. To suggest a class or to inquire about private lessons please send a note by email. You can keep an eye out for the next series of workshops here or on social media. If you would like to hire A Fine Medley to host a private workshop for you and your friends, a corporate building session or to travel to teach a class at your space, then please contact me for details.